I am tired of teachers who complain about their jobs. I get it. Being a teacher is really, really hard. It’s one of the few jobs where the better you are, the harder it is. After all, it’d be easy to be one of those teachers who just sits behind a desk all day while his or her kids do worksheets. It’s a lot harder when you’re invested in your kids, when you spend evenings making crafts and coming up with lessons, when you spend nights staring at your ceiling, not able to sleep because you’re worrying about troubled students. It’s harder when you care. And it’s getting even more difficult. Common Core, budgets constantly being cut, increasing class disparity, standardized testing… It’s not all glitter and Lisa Frank binders, y’all. But it’s still an amazing job. Every day is different, you feel like you’re making a difference, and at the very least, you’re done by 2, 3:00 most afternoons. Lately, though, teachers don’t seem to get this. Lots of my Facebook friends are teachers, and I follow a lot of teachers on Instagram. It’s summertime, and we’re all rejoicing in being able to sleep late, stay up late, do whatever we want to do. We’ve earned this time. I get it. I really do. It’s like a huge signal that says it’s time to think about being an adult again. 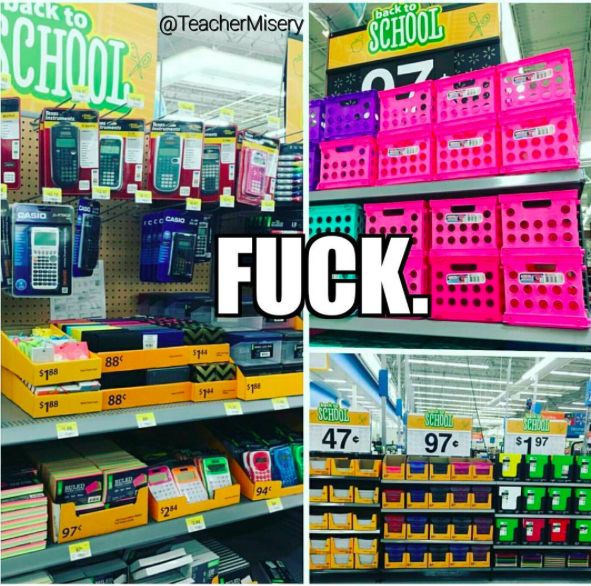 Everybody feels a bit of back-to-school dread; that’s normal. But lately there has been this pervasive trend of negativity among teachers, especially online. We’re quick to defend ourselves and explain that we earned that money all year, and we don’t stop working just because it’s summertime, and we’re constantly working and planning and blah blah blah. Because being devoted to your job is a bad thing, suddenly? Let me be clear. I am no veteran teacher with decades of experience, but I’m not brand new at this, either. I’ve been a teacher for ten years, and one thing I’ve learned is that the teacher’s attitude in the classroom sets the tone for the entire class. And the more you surround yourself with negativity, even if it’s just in the form of internet memes, the more you start to believe those things. Constant exposure to such negativity can make deep inroads into your bank of positivity, leading you to either become negative—diffident, anxious, and distrustful—yourself, or to become indifferent, uncaring, or even mean towards the negative person. I understand that sometimes, teachers share things like this because they’re stressed out. I can’t tell you how many times I’ve been in that “you have to laugh to keep from crying” mindset myself. But this is our job, our livelihood. We have to control the way we think about what we’re doing. We’re in the classroom for seven hours a day, 180 days. That’s a lot of time to spend hating your life. Besides, there are many more effective, positive ways to deal with stress. But don’t do this. Don’t spend one more second in this weirdly passive-agressive negative headspace. And more importantly, if you find that this isn’t just a temporary phase, but it’s how you actually feel, please consider doing something else. If you don’t do it for yourself, do it for the students who are in your classroom. They deserve a teacher who loves his or her job, who wants to be there. Not someone who is just counting down the days until retirement.